SAIL Notification is out. SAIL is recruiting for 30 Jr. Staff Nurse Trainee Govt Job Posts. 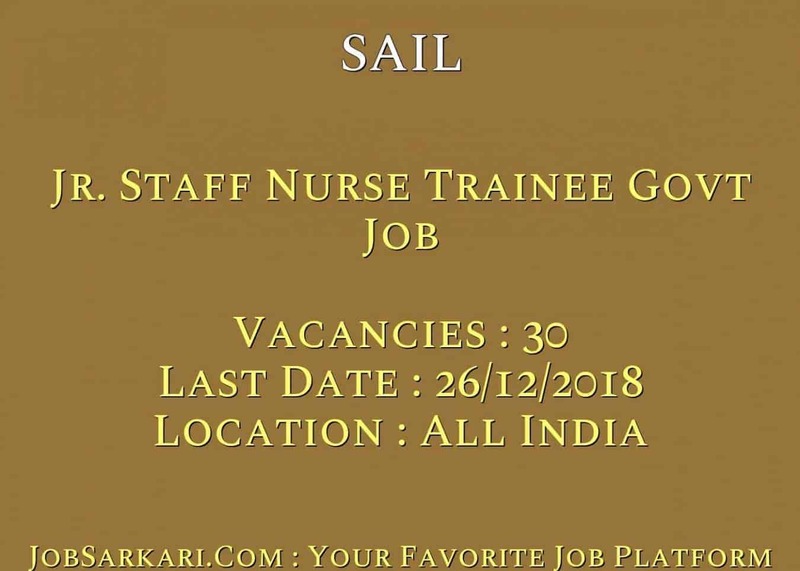 You can check SAIL - Steel Authority of India Limited last date, download SAIL notification, visit SAIL official website and check other SAIL Vacancy details.Complete Vacancy and recruitment Details about 30 Jr. Staff Nurse Trainee Govt Job vacancies in SAIL are provided below by JobSarkari.Com only for you. Jr. Staff Nurse Trainee 16 03 03 07 30. Candidate Must Have Passed B.Sc Nursing / Diploma in General Nursing and Midwifery With Registration in Nursing Council of India / State Nursing Council and Having One Year of Experience. 1.Trade Test / Skill Test. Height 150 cms. 143 cms. Weight 40 Kgs. 35 Kgs. Q. What is the Last Date For SAIL Jr. Staff Nurse Trainee Govt Job Vacancy ? A. 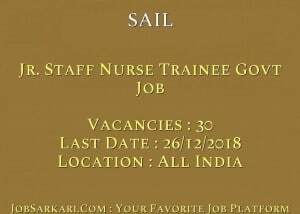 Last Date for SAIL Jr. Staff Nurse Trainee Govt Job Posts is 26/12/2018. Q. What is the Form Type of SAIL Jr. Staff Nurse Trainee Govt Job Recruitment ? A. The Form Type for SAIL Jr. Staff Nurse Trainee Govt Job Posts is Online. Q. How many vacancies are available in Steel Authority of India Limited Jr. Staff Nurse Trainee Govt Job Posts ? A. There are about 30 Vacancies in Steel Authority of India Limited Jr. Staff Nurse Trainee Govt Job Posts.